US First Lady Melania Trump on Tuesday kicked off her first major solo trip in Ghana's capital Accra, aiming to cast a positive light on her embattled husband's administration. 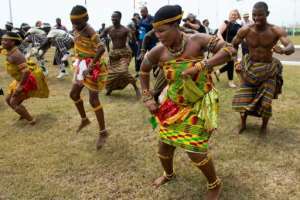 She beamed as she was welcomed by a troupe of traditional drummers and dancers. "Thank you very much," she said with a smile. Her office said it will also "showcase" the work of the US Agency for International Development (USAID), even at a time when her husband's government is looking to slash US aid across the world. But unlike her predecessors, her visit will be followed closely to see if she can build bridges after the president reportedly dismissed Africa as a collection of "shithole countries". But as Melania Trump attempts to step out of her husband's shadow, this trip has been seen as an attempt for her to carve her own diplomatic path. That hasn't stopped Donald Trump from weighing in last week, when he told journalists that his wife was "making a big trip to Africa". Melania Trump's visit to Ghana will inevitably draw comparisons to when former president Barack Obama and his wife Michelle visited Ghana in 2009.